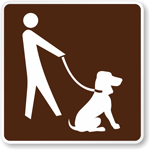 An Accessible Trail Campground Sign will keep handicap campers aware and safe. • 3M's brightest sign material with 3x the reflectivity of High Intensity and ten times the reflectivity of Engineer Grade signs. • Signs combine high daytime conspicuity with the high nighttime reflectivity and wide angle reflective performance. • Carries the 3M warranty for traffic signs - signs are guaranteed to last at least 12 years outdoors - although in practice most signs last even longer. Signs are printed with 3M screen printing or 3M outdoor digital inks designed specifically for outdoor traffic and parking signs - for the ultimate in durability. • Made of 63 mil thick non-rusting aluminum. Rounded corners - for easy handling and a professional appearance. Competitive signs often use a lower cost (and more hazardous) square corner. Signs have prepunched / precleared holes to insure a hassle-free installation. • Outlasts wind and abuse. Once installed, and unlike 40 mil aluminum signs, they are virtually impossible to bend. Note: we use 63 mil aluminum for our 12" x 18" parking signs, specified by most government or city agencies for their parking signs.